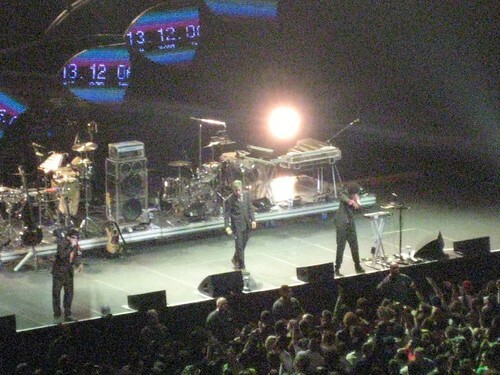 Mary and I saw the Beastie Boys on Friday night at the Air Canada Centre. We had great seats just off to the left side of the stage. The picture above was taken by someone at their performance in Montreal the night before, but the stage and set looked identical on Friday night. It was a great show! The crowd went nuts when they finished off with Intergalactic and Sabotage. We were on our feet for the whole show. Split into a separate topic. I saw the Beastie Boys live several years ago on the Ill Communication tour. Rollins Band opened and I am not sure if I have ever seen a concert that good since. They (the Beastie Boys) put on a great show. They certainly did put on an awesome show! It was one of the best concerts I've ever been to. I think the most memorable part in the concert for me was when they performed "Intergalactic". That was awesome! That is the song that sparked my interest in the band about 10 years ago (and they've been one of my favourite bands ever since). The opening act sucked though. Some group from Montreal called Cromio (I'm not too sure if I have their name correct, because they only mentioned it about 50 times ). Do they normally do Heart Attack Man live? How was Rollins. I haven't seen him do a "Rollins Band" thing, but I caught his spoken word tour once. I've seen Rollins Band three times, twice in a smaller club (Bogarts in Cincy) and once at the arena show with teh Beasties. He was very intense on stage each and every time I saw them play live. I had always been a fan of Henry Rollins since his Black Flag days and very rarely missed a chance to see him play live. Oddly enough, I have never seen him do spoken word. Speaking of spoken word tours, I have seen a few in my time, with the two most interesting probably being Iggy Pop and Jello Biafra. IP spent most of his time just telling stories from his sordid career. JB, on the other hand, spent a lot of time talking about really crazy stuff; stuff that wouldn't surprise you coming from the singer for the Dead Kennedys. I remember being pissed in the mid-80s when my parents said "no" to me seeing the Beastie Boys live with Murphy's Law and Fishbone when I was in Junior High. This was when License to Ill was huge and just before Paul's Boutique hit. The latter is probably my favorite Beastie Boys album, while being their least successful. That would have been quite a show. Beasties, Fishbone, and Murphy's Law. Man, I haven't even heard the name Murphy's Law since high school. I'll have t dig up some stuff by them now; the nostalgia bug has been bitten. I've listen to the Jello Biafra spoken word album, "I Blow Minds for a Living". I really really enjoyed it. Seeing that in person must have been an experience. I was a little LTTP when it came to Rollins. I came on board during the Rollins Band years (intro was the End of Silence album). But then I did the good things, and looked up the old Black Flag stuff. I saw Jello on that tour. I still have a handbill somewhere, stuck into the CD case I think. Hard to believe that was 16 years ago. Did you see him at UC? Yep. I'd actually graduated a couple of years earlier, fortunately they didn't limit it to students but it did sell out...I think. I do remember that the line was huge. I'm going to see the North American premier of Van Halen's new tour on Thursday night. I'm curious to see how DLR does back in the lead. I'm actually more of a Van Hagar fan myself, but who can say no to this kind of event, especially since they might break up before the tour ends! I was at the same show. I was a Wright State University student, but a friend of mine went to UC and got us student tickets. QUite an interesting night to say the least. Van Halen Rocked the Mother Effing house! Eddie is a guitar GOD. DLR still has the vocal chops he had back in the day. Excellent show. DLR still has the vocal chops he had back in the day. That's good to hear. From all the abuse he has laid on his body over the years, I was afraid his voice would suffer.